Home Brow and Lash Brushes New New Items Sigma Sigma Beauty Sigma Brushes NEW Brow and Lash Brushes From Sigma Beauty! NEW Brow and Lash Brushes From Sigma Beauty! Today we are launching the latest Sigma brushes, the E75 – Angled Brow and E80 – Brow and Lash. These brushes are a must have for defined and well groomed brows and lashes. 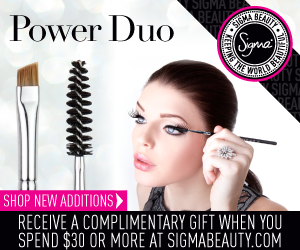 Both brushes will be sold individually, making them the perfect addition to any Sigma kit! The angled brow brush (E75) was designed specifically for filling in, defining and strengthening thin or sparse eyebrows. The E75 works best when used with powder or gel products to create full and defined brows. (We love that bold brows took center stage in the spring runway shows)! The brow and lash brush (E80) is essential for grooming eyebrows and eyelashes; the “mascara spool” design provides the ideal firmness for precise control in these areas. Use the E80 to brush through brows to determine areas that need to be filled in; also use it to brush through lashes for an elongated effect and to separate any mascara clumps.